The Super Sauna Photon Genius is a dynamic energy sauna that provides more direct and targeted harmonic energy infrared (including full spectrum) than any infrared sauna in the world. This combination importantly helps the body produce more nitric oxide (NO), the “miracle molecule” which helps preserve the elasticity of all the vessels in the body, because it is a “signaling molecule” that tells the blood vessels to increase in width or dilate. This has significant implications, because optimal blood circulation is a key factor in virtually all health issues, including Heart Disease, Alzheimers, Diabetes, Cancer, Obesity, Arthritis, Anti-Aging, etc. Read more HERE. The Super Sauna Photon Genius represents the culmination of over 50 years of research and development from founder, inventor Ed Skilling. View the Photon Genius Summary HERE. 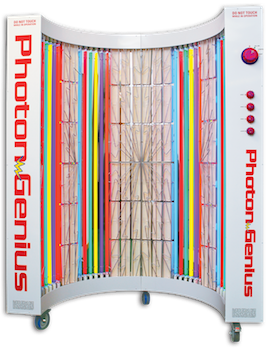 PHOTON GENIUS owners report effective clearing of all types of serious infections including: infections of the eyes, ears, throat, sinuses, bronchial tubes, lungs, bladder, intestines, teeth, etc. Here’s an example of a man’s crushed toe and foot that led to extreme infection. The Super Sauna Photon Genius encourages the body to produce the highest concentrations of Nitric Oxide (the miracle molecule) which improves circulation and fights infections at all levels of the body.